This 12'x48' Lean-to Shed is shown with standard 10' wide overhang. 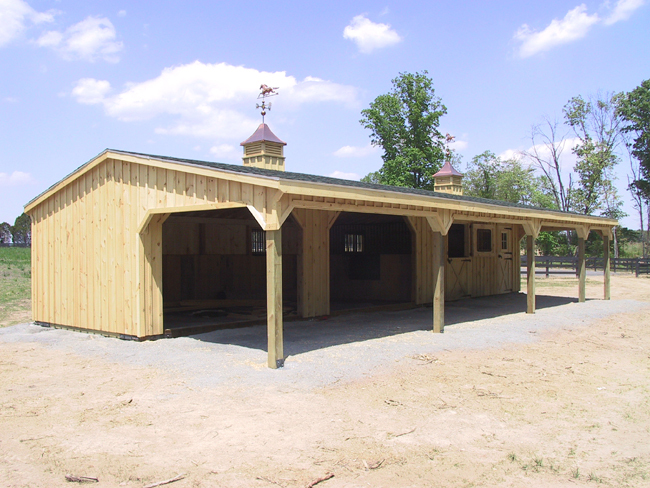 This barn has (2) 12'x14' run-ins, (1) 12'x12' stall, (1) 12'x8' storage room and two optional 24" cupolas on roof. There is no partition installed between run-ins, only between stall, run-in and storage room. Other optional features include weathervanes and windows installed in both, Dutch & entry door. Prices shown exclude delivery, lean-to overhang assembly and PA sales tax. *Base price Does Not include cupolas, weathervanes, windows in Dutch door or service door.